I’ve finally managed to break away from this game long enough to write something about it, which I suppose is a miracle in itself, as this game has kept me pinned to my computer for unreasonable amounts of time. It’s been quite awhile since I last played a game that’s kept me this interested (excluding Halo), and after all the hours I’ve put in, I’m not even close to finishing this beast of the game. Now, it’s worth mentioning that I’ve not played any of the other Saints Row games. While I have heard good things about the second and third games, they never really peaked my interest. A good friend of mine came to me with the fourth game, and said that we should play it together, and we did. As mentioned before, I was instantly hooked. It goes without saying that the newest installment of the Saints Row series is a game that blurs the line of how over the top a game can be, while still providing a cohesive storyline and fun gameplay. Certainly, this is a game that doesn’t attempt to take itself too seriously. For God’s sake, it gives you super powers. The simple fact that I can run on water, or up a tall building, provides hours of fun, and that's not even counting the other eleven billion things there are to do in the city of Steelport. 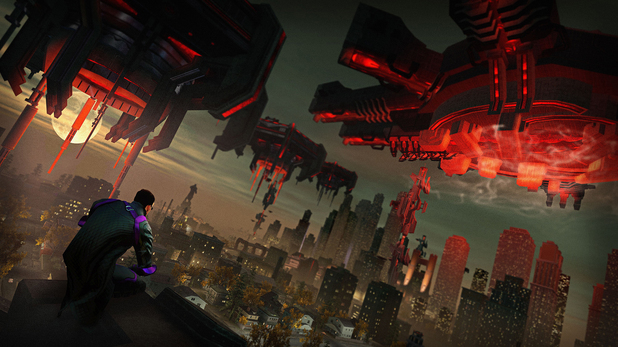 Now, however, it’s time to take a look at what makes Saints Row IV tick. Our story opens up with our beloved Saints en route to stop a terrorist cell from doing bad things to the rest of the world. No, I’m really not joking, the story starts with your character and the rest of the team in a helicopter on its way to a drop point. After a few cut scenes, and an extremely over the top action sequence, you’re finally able to take control of your character. Your goal is to navigate the terrorist hideout, kill the terrorists, and stop them from launching a nuke. The opening of this game is very much a parody of Call of Duty games, and I think it does quite a good job of poking fun at the franchise. At one point, you break down a door and activate a slow-mo sequence to gun down a room of unsuspecting terrorists. After mindlessly killing several rooms of enemies, you find your target and attempt to kill him. At this point, the game introduces you to its use of quick time events. For those of you who loath quick time events, don’t worry. For the most part, the game is free of them, and they’re nothing too frustrating to handle. After you beat up the terrorist leader, the missile launches, prompting you to jump onto the missile and climb it as it rockets through the air, ripping out the wires. After succeeding this, a cut scene pops up, showing that your deeds have earned you the position of president of the United States. How’s that for an intro? As I mentioned before, Saints Row IV does manage to take this goofiness in stride and provide a good story. If you’re backing away from this game thinking “this is absurd”, I’d strongly recommend giving it a shot regardless. I won’t really get much into the story, since I honestly feel it would give too much away, so let’s talk about the gameplay. Shortly after the intro, you’re introduced to the city of Steelport, and a huge sandbox in which to run around in. After being shown the basics of purchasing clothing, weapons, ammo, and how to use the garage, you’re thrust into the world to do as you please. For those of you wondering how big your playground is, not to worry, there’s plenty of room to romp around. I won’t lie to you, I spent a good few hours at the beginning of the game just driving around causing mayhem. While it can be a tad confusing to navigate on occasion, exploring the city is a well rewarding experience. For example, you can often find some of the games better stock cars by roaming around. Doing this allows you to nab the car, and head over to your garage to customize it. In one of my safaris into the heart of the city, I found a Johnny Gat mascot truck. Unfortunately, I drifted off of the bridge trying to catch it, but it was still a cool thing to see. However, as cool as cars, motorcycles, aircraft, and tanks are, there’s another way to navigate the city that provides an equally interesting experience: with your super powers. At the start, you only receive two powers; super sprint and super jump. As simple as these powers may seem, they entirely change the way you can play the game. As you get upgrades, super sprint soon allows you to run faster than cars, run up buildings, on water, and even sprint forever. Using this can quickly get you across the city. Super jump, as you would expect, allows you to leap high into the air and quickly scale buildings and jump gaps. Some of you are probably thinking that super powers wouldn't fit into a GTA style world, but Volition managed to seamlessly fit them into the game. First off, you’re not required to use your powers to navigate the city. I often find myself driving around instead of using super sprint. Secondly, the world offers many challenges and collectables based around your powers, so using them to find locations and complete objectives feels natural. Finally, the game will keep you in check with its notoriety system. If you run around destroying things with your powers, eventually a warden will come after you, which provides a suitable challenge even with your powers. I’ll admit, by the end of the game, you’re going to be so over powered that it doesn’t matter, but what do you expect, really? The final things I’d like to talk about are how immersive the city of Steelport is, and the game’s problems. There’s no doubt in my mind that all of you have played a large, open world game at least once. Be it one of the Elder Scrolls games, or GTA. Veterans of these styles of games have most likely dealt with “big world syndrome”, as I like to call it. What I mean by this is as time goes on, the world starts to feel much more empty, and like a gimmick due to running into the same dialog, people, situations, or just out of things to do as you put more time in. 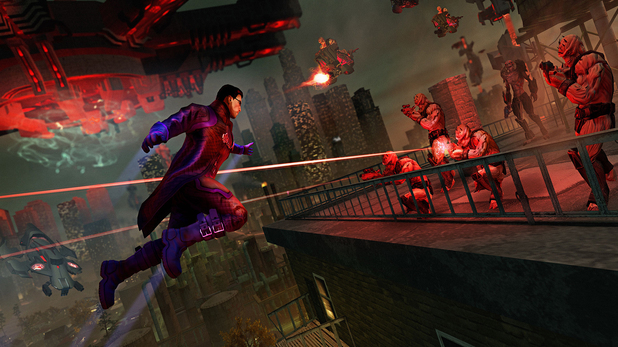 Saints Row IV, without a doubt in my mind, is one of those games. While I haven’t finished the game, I have ran into enough situations of hearing the same dialog, and getting into the same situations enough for it to leave a mark on me. It’s not enough to deter me from playing the game by any means, but it will become annoying as you start to raise that completion percentage. As for our last topic, the game is relatively free of major problems. The most I’ve seen besides the occasional spastic AI, is a few minor texture glitches. Nothing game breaking, but it certainly gets points in that department. So, here we are at the end once more. If you’re just looking for a quick answer, yes, you should play this game. Its extreme quirkiness, sense of humor, awesome weapons and vehicles, and fun missions and story make it an extremely worthwhile experience. If you’re looking for something to sink many hours into, and have a good time trying 100%, this is your game. Also, a special thanks to Madara Uchiha for giving me the chance to play this game, and for being generally awesome.